It is extremely fast and maneuverable, but has thin armor and below average gun performance. 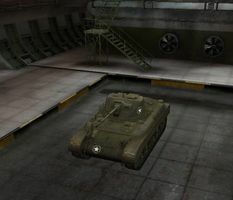 However, the gun's weaknesses are offset by a decent dispersion penalty, so proper use of the M7 will employ all of the tank's strengths: high rate of fire, speed, and mobility. If exposed to enemy fire, the M7 can be destroyed rather quickly, so caution must be taken when engaging the enemy. The M7 is an excellent tank to have in a wolf pack, letting the sturdier medium tanks take the shots while the M7 flanks, keeping the enemy tracked or inflicting steady damage to the target. The M7's terrible armor and low penetration result in it being somewhat dismissed. However, in the proper hands, the tank excels in many roles. It performs well as a flanker, and on the battlefield a good flanker is very important. The abysmal armor means that you will have to resort to guerrilla tactics, because a frontal assault is not an option under almost any condition. Flanking, stealth, using cover and situational awareness become paramount if you aim to be successful, because even lower-tier tanks are a serious threat to you. However, if you manage to stay alive, the high maneuverability and speed of this tank will let you relocate, flank and do evasive maneuvers with ease, bringing your steady guns to bear. The 6-pounder is considered to be the best gun for the tank, given a high rate of fire, best penetration values, though less-than-superb alpha damage, partially compensated by the high RoF. The guns combined with flanking maneuvers mean that enemies will receive a non-stop hail of fire into their rear armor to which most will succumb. 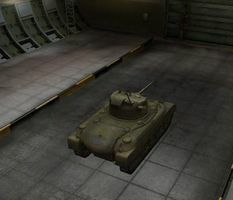 In addition, with full camo skills, the M7 is extremely difficult to spot, making an efficient active, and passive scout. However, if spotted, relocation is a must, as you will be turned into scrap metal in an instant if you don't. In the early game, acting as a scout and taking a few shots is fine. Flanking should be reserved for the later game when you can assassinate isolated tanks, or when the opportunity presents itself. Sadly, nothing gets carried over from the M5 Stuart. You desperately need to upgrade your firepower, by Tier V stadndard the 75mm M2L is seriously underpowered. Research the 6-pounder as soon as possible. It will give you a much-needed boost in penetrating power and damage. You can research the Wright Continental R-975C1L engine at any time from here on. Research the SCR 528 radio next to prevent losing contact with teammates on large maps. 410m isn't a *great* radio range, especially on mid-Tiers where this parameter still matters. Also, this is the top radio for the M7 Priest, the Chaffee, the Tier VII and VIII American heavy tanks and the Tier VIII and IX American medium tanks and tank destroyers. You'll thank yourself for unlocking it early once you get up to the higher tiers. Researching the upgraded suspension next will make you a little more nimble and you'll need the extra weight capacity to mount equipments. 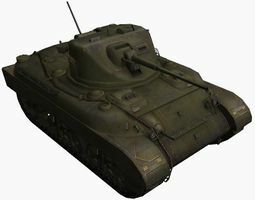 It is advised that one research 75mm M3L only for unlocking the next tank, T21, as that negligible 2mm of penetration and some accuracy (not to mention the latter is very limited by low shell speed) simply worths not using. It's essentially the M3 Lee's gun on a tank that's one Tier higher... absolutely pointless; the 6 pounder is the gun that makes the tank most effective. 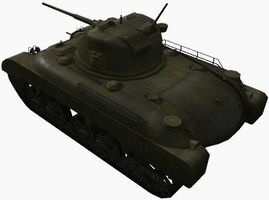 The T7 Light Tank/ M7 Medium Tank was originally designed to replace the M3 Light Tank and M5 Light Tank, but it outgrew its original purpose and was accepted for production as the M7 Medium Tank before being cancelled. By the autumn of 1940 the US Armored Force was beginning to look at replacing the existing M2A4 and M3 Light Tanks, both of which were armed with a 37mm gun, carried fairly thin armour and had little potential to be upgraded. In January 1941 the Armored Force issued a more detailed specification for the new vehicle. It was to weight around 14 tons (short), have a low profile, be armed with a 37mm gun and carry up to 38mm of armour. The Rock Island Arsenal produced two designs, the T7 and the T7E1. The basic layout was the same on both. The new tank had sloped frontal armour, curved sponsons over the tracks and a smoothly curved turret. They differed in details. The T7 was to have a welded hull, cast turret and vertical volute suspension (as used on the M3 and M5 Light Tanks). The T7E1 was to have horizontal volute suspension, a cast/ welded turret and a riveted hull and superstructure. The new tank was longer and wider than the M3 family, not having suffered from the same width restrictions as the earlier design, but it was slightly lower, giving it the required low profile. Neither of these original prototypes were completed. Riveted construction was abandoned during 1941 and so the T7E1 was cancelled. Work on its chassis was already quite advanced, and it was later used for suspension and transmission tests. A wooden mock-up of the T7 was built, and in the autumn of 1941 the Ordnance Department decided to move on to three new prototypes. The T7E2 was to have a cast hull and turret and Wright R-975 engine. The T7E3 had a welded hull and turret, twin Hercules diesel engines and automatic transmission. 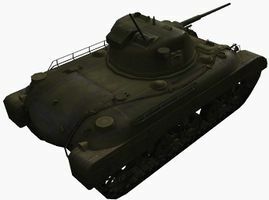 The T7E4 was to have a welded hull and turret and the same combination of twin Cadillac engines and Hydro-matic transmission, already under consideration for use in the M5 Light Tank. These three prototypes would have been around 16 tons in weight. After some further development work the T7E2 was accepted as the most promising of the three designs. The design was officially approved in December 1941 and work began on a single prototype. While the tank was under production it was decided to arm it with the same 57mm gun then being used on the Canadian Ram tank. This was a version of the British 6pdr gun. The turret ring from a Ram was combined with a modified T7 turret and this version of the tank was completed in June 1942. At this stage the T7E2 performed well, and would have been a useful replacement for the M3 and M5, but the Armored Force made further changes. 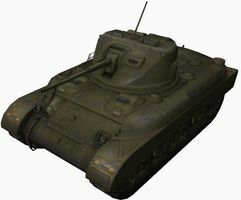 As the T7E2 prototype was being completed they requested that it be up-armed to carry a 75mm gun, and asked for thicker armour. With the new turret the tank now weighted 25 (short) tons, making it a medium tank. 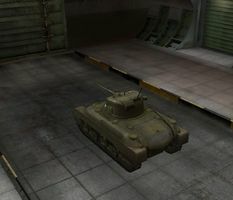 In August 1942 the T7 was standardized as the M7 Medium Tank. International Harvester Co was awarded a contract to produce 3,000 M7s, with the first to be delivered in December 1942. 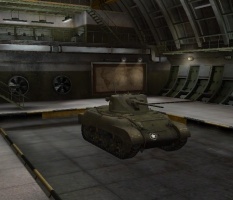 The first production-standard M7 reached the Armored Force at Fort Knox in December 1942. It proved to be very disappointing. Fully loaded it weighted 29 (short) tons, but still had the same engine as when it was a light tank. It was thus badly underpowered giving it poor performance. 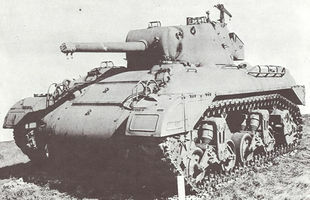 In an attempt to fix this problem work began on the M7E1, which was to use a Ford V-8 engine, but the Ordnance Department began to worry about the duplication of effort involved in producing two medium tanks. 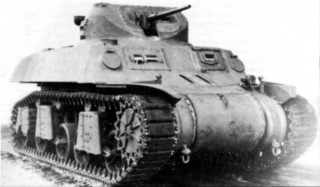 The M4 Sherman was now in full production and didn’t have the same problems as the M7. In February 1943 production of the M7 was cancelled, after seven had been completed. 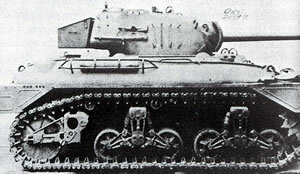 Work on the M7E1 continued for a little longer, but was cancelled in July 1943. The failure of the M7 meant that the US Army had to begin work on a new light tank. The eventual solution was the M24 Chafee, but this didn't enter service in large numbers until late in 1944, leaving the M5 Stuart to fight on in British and American service despite being badly under-gunned and under-armoured. This page was last modified on 21 June 2018, at 22:26. This page has been accessed 271,036 times.